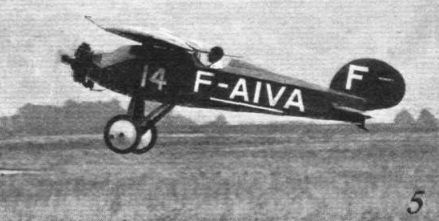 The Albert monoplane (Salmson), a single seater, covered entirely with three-ply which gained it 15 points immediately. THE FRENCH LIGHT 'PLANE COMPETITION AT ORLY: The eight competing machines: 4. No. 6, Albert T.E.1 (pilot, Descamps). THE FRENCH LIGHT 'PLANE COMPETITION AT ORLY: The eight competing machines: 5. No. 7, Albert T.E.1 (pilot, Thoret). 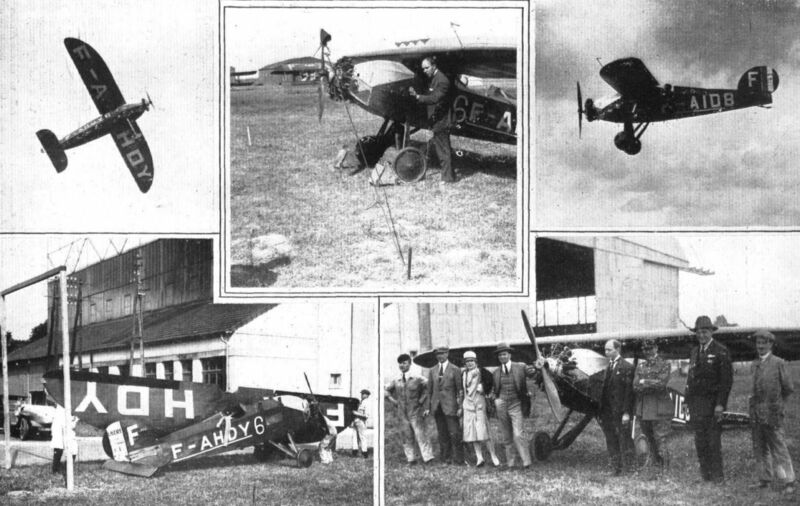 TAKING OFF AT ORLY: (5) The neat little Albert (Salmson) monoplane flown jointly by M. Magnard and M. Fisbach. THE ALBERT-SALMSON TEAM: In the lower right-hand corner, from left to right: Delzongles, chief mechanic; Descamps, pilot of No. 7; Madame Descamps; Duhamel, designer; Albert, constructor; Thoret, pilot; Magnet (of the Salmson Company), and Metrot, also of the Salmson Company. On the left, Thoret's monoplane passing the folding test. Above, M. Albert trying vainly to start the engine with a "Heath Robinson" starter, and in the upper corners the two machines in flight. Cowling arrangement of the Walter 60 h.p. engine in an Albert monoplane. FOLDING TESTS AT ORLY: Our machines showed superiority in the folding tests at the French Light 'Plane Trials. 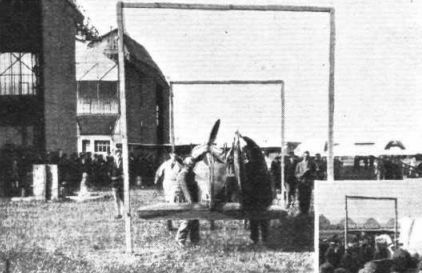 (1) The Albert monoplane passing through the posts.